We are pleased to announce Alexander Brodsky’s Planetarium, an exhibition dedicated to the Russian artist Oleg Kudryashov and the Swiss architect Peter Märkli. The two form an unexpected constellation, brought together within Brodsky’s creative universe. Devised by Brodsky in dialogue with curator Markus Lähteenmäki and gta exhibitions, the Planetarium displays and juxtaposes Märkli’s and Kudryashov’s creative practices. In the middle of the exhibition space, a mysterious container presents works by Peter Märkli, whom Brodsky characterizes as “a solitary planet in the architectural skies”. The immersive “vehicle for seeing” will map the movements of this planet, projecting onto its walls the creative and rigorous moments of drawing, research and modelling through which Märkli’s architectural imagination unfolds. The juxtaposition of drawings that are searching for form and composition with larger project drawings and models reveals an imagination working towards actual buildings. The rest of the gallery will be devoted to the works of Oleg Kudryashov, in most cases executed in drypoint directly on zinc plate and printed on large sheets of paper, containing and effectively expressing the rigour of the process in all its power. Every mental movement and physical deviation is carved on metal and reproduced on paper. The powerful lines construct windows onto worlds in which the line sets its own rules for its own architecture. 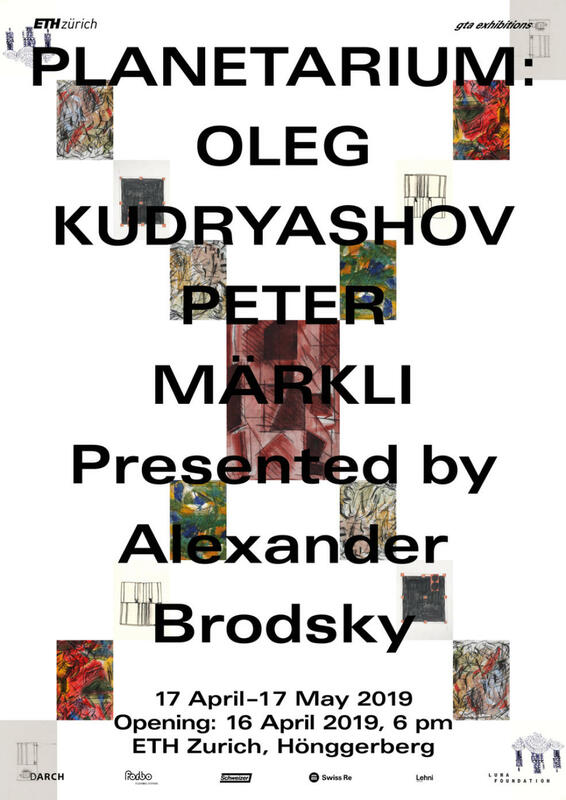 In the foyer outside the gallery stands Alexander Brodsky’s 1/8 Pavilion for Vodka Ceremonies. This replica, built by Anton Gorlenko with the assistance of Anton Gribanov, revives the pavilion originally built in a rural Russian landscape in 2003. Constructed of 83 windows all facing inwards, the pavilion turns the normal parameters of architecture inside out. Instead of a room within a landscape, it becomes a landscape within a room. The placement of the replica, on a scale of 1:8, in a room that has been built for it, along with documentation of its construction and Yuri Palmin’s photographs of the original pavilion, highlights the questions of scale and the tension between the landscape and the interior. A planetarium is a device that extends our understanding and shows us something that we don’t normally see. It has the power to compress eternity into a single room and turn an interior into an infinite landscape in which the boundaries between past, present and future, between process and object, become unclear. The Planetarium at gta exhibitions also has these qualities, but it shifts the attention from the universe on the stellar scale to the universe on the architectural scale. It presents three different projections of architecture – from Kudryashov’s individual sheets of paper that simultaneously create architectures and also express the entire process underlying them, to a room stacked with hundreds of sheets of paper testifying to Märkli’s creative labour, and an object that is simultaneously a building and also a representation of it. This Planetarium maps the movements and habits of the basic units of the architectural universe – landscape, building, room and line – and seeks to show us something that transcends our ordinary vision of architecture.